Membership – Join the HSA! 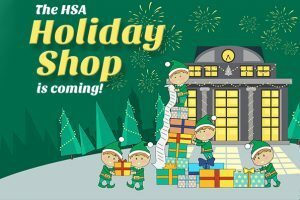 The HSA is pleased to announce that the Holiday Shop will be coming to Harbordale from November 26th – 30th. We have partnered with the “Holiday Gift Shop®” to provide a large variety of special gifts that our students can purchase for their family and loved ones this holiday season.The “Holiday Gift Shop” program will be set up at the school and supervised by our parent volunteers. They will help the children pick that perfect gift for the price they want… in a familiar, comfortable atmosphere. There will be a large variety of gifts in different price ranges to choose from. Simply use the “money control” envelope that was sent home with your child(ren) to help them decide who they should buy gifts for and how much they should spend. You can even suggest ways that your child can earn extra shopping money! Volunteers are needed for this fundraiser – please see the sign-up sheet! © 2017, Harbordale School Association. All rights reserved.